I take notes all the time. A lot of it is because my creative ADD sets in and don't remember what I was talking about but it's always good to have concrete notes to fall back on when multiple people heard or interpreted things differently. I just read an article showcasing another reason to take notes. If You Aren't Taking Notes, You Aren't Learning. 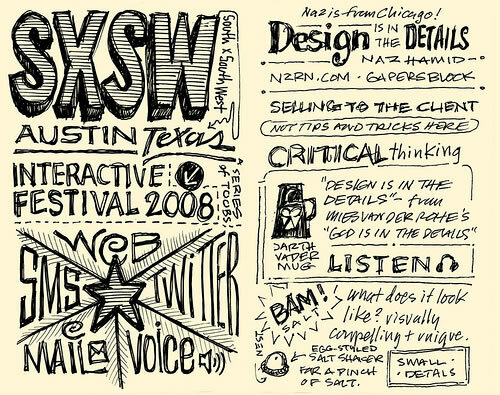 Another quick article, Mike Rohde SXSW Notes, showcases how much fun it is to put the computer down and take notes with good ol' pen and paper. It makes so much sense. With the amount of information we take in on a daily basis, there is no way for us to remember it all. Taking notes and organizing those notes will not only make you a Danny Tanner (if you don't know who that is . . . google it) in the making but it will make you a better person and professional. Some of my favorite excerpts are below, but click the link above and read the whole article. "...experts understand simple things deeply. They return to the basics, over and over again. eBay CEO John Donahoe is widely regarded as one of the premier execs in the Valley right now and I'm told is an avid note-taker to boot. He recently said on LinkedIn, "Great leaders are never too proud to learn." "I take lots of notes in paper mole skin notebooks; every week or so I go back with a different color pen and circle the key sentences; I then transfer these ideas to Evernote files on my computer; and finally, I blog/tweet/publish/email out the crispest, most important ideas or quotes." "My theory: The audience was mostly students. Experts -- or those who have deconstructed what experts do -- take notes. Novices don't see the point." Do you have fun moleskin notes? Share a link in the comments below.